Centre says execution by lethal injection can be more barbaric. It also said death sentence is awarded in the rarest of rare case of abhorrent and barbaric acts and making the execution overly comfortable will bring down its deterrent effect. The Centre has made the submissions in a counter-affidavit filed in response to a PIL by Supreme Court advocate Rishi Malhotra seeking abolition of execution of death sentence by hanging saying the same is not instant and is violative of right to die with dignity. Malhotra had prayed that provisions contained in Section 354(5) CrPC be declared ultra vires the Constitution and in contravention of Article 21 of the Constitution being discriminatory and violative of the Article. He had also prayed that “Right to Die” by a dignified procedure of death de declared a fundamental right as defined under Article 21. The Centre, in its counter, said these were sensitive issues which are exclusively a matter of legislative policy and ought not to be entertained in a PIL. 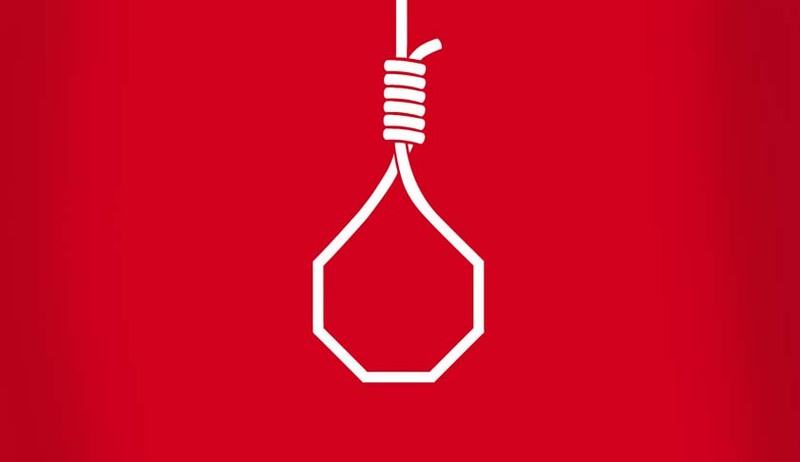 It is to be noted that the mode of execution in India is described in Section 354(5) of the CrPC where in it has been provided when any person is sentenced to death, the sentence will direct that he be hanged by the neck till he is dead. The counter-affidavit referred to the Deena v. Union of India 1983 verdict wherein the Supreme Court had held that Section 354 (5) of CrPC does not violate the guarantee contained in Article 21 of the Constitution and in that case also the court had considered different methods of execution such as electrocution, shooting, lethal injection employed in various jurisdictions around the world and came to the conclusion that hanging stands out as the most suitable mode of execution. *It is easy to assemble, quick and simple. *Free from anything that would unnecessarily sharpen the poignancy of the prisoner’s apprehension. *Quick and certain means to execute death penalty. *Chances of accidents can safely be excluded. *Eliminate the possibility of a lingering death. *Unconsciousness supervenes almost instantaneously after the process is set in motion and death follows. *Avoids to the full extent the chances of strangulation which results on account of too short a drop or of decapitation which results on account of two long a drop and thus consistent with the obligation of the state to ensure that the process of execution is conducted with decency and decorum without involving degradation or brutality of any kind. It said the procedure by which a death sentence has to be executed is dependent upon a variety of factors, such as the economic feasibility, availability of skilled and trained personnel, equipment and resources, rate of botched-up execution etc., which is a matter of legislative policy that does not warrant interference of this court. The counter affidavit said if the prayer of declaring section 354(5) CrPC is held to be unconstitutional, then in the absence of an alternative mode of execution there would be a vacuum in law which would in turn force a moratorium on death sentences with several convicts on death row which is highly undesirable. It also referred to the Law Commission’s 35th report from the year 1967 which concluded that the method of execution of death sentence should be certain, humane, quick and decent but admitted that they were not in a position to come to a firm conclusion as to which of the method satisfied the test as it waited and depended on the progress to be made in the field of science and technology etc. The commission, in its 187th report titled Mode Of Execution Of Death Sentence And Incidental Matters in October 2003, recommended that Section 354 (5) CrPC be amended by providing an alternative mode of execution of death sentence by administrating legal injection until the accused is dead. However, the report failed to consider factors such as medical professionals are unlikely to participate in execution by lethal injection, the possibility of failure of chemical which will be used for such lethal injection has not been factored. Similarly, there are problems of finding the right vein, right doses and other associated complications, the key issue of technical requirement being both hardware and software being available at the jail for conducting this mode of execution has not been taken into account. The Centre also said that the United States of America has been one of the leading countries to have adopted the mode of lethal injections in many of its jurisdiction but since it adoption lethal injection has gained the dubious distinction of having the highest rate of botched up execution within the United States between 1900 and 2010 (more than double of that of hanging). “Even when 110 years’ history is broken down into four parts -between 1900 to 1919, 1920 to 1949, 1950 to 1979, and 1980 to 2010, one can easily observe that hanging has clearly been a safer and more reliable mode of execution,” it said. Lethal injection, the Centre said, though is believed to be painless, has also been contested on the ground that it may lead to uncomfortable death wherein the convict is unable to express his or her discomfort because of paralysis by the paralytic agent injected and that it is believed by many that lethal injections are designed to create only an appearance of serenity and painless death. Joseph Rudolph Wood III suffered what is being called as one of the longest executions in the history of the US where it took nearly 2 hours to complete the process of execution. It has been reported that he gasped 660 times before he died in Oklahoma. When Michael Wilson was injected with the lethal injection cocktail, he said out loud that his whole body was burning. On January 16, Dennis Mcguire's execution took nearly 25 minutes to complete, the longest in Ohio’s history, during which he gasped several times. In April, executioners pushed an IV catherer straight through a vein on Clayton Locket’s (a convict) groin so that the drug-filled his tissue and not his bloodstream. Locket reportedly writhed and grimaced, at which point the executioners closed the curtains and tried to call off the execution but in vain as he eventually died of a heart attack after 20 minutes. A shortage of chemical sodium thiopental, a fast-acting barbiturate and general anesthetic, has also been reported to lead to consequential delay in execution. This shortage is reportedly due to refusal by drug makers to provide drug for the purpose of execution. Many other executions through lethal injections have had disastrous consequences due to reasons ranging from allergic reactions, difficulty in finding veins for IV tubes to malfunctioning of equipment. The Centre said modes other than the present modes of execution of death sentences if bungled, can lead to results that could be called barbaric, inhuman, and cruel. “The procedure followed for execution by electrocution or lethal injection or firing squad could be just as inhumane or barbaric to another person. As far as likelihood of execution getting botched up is concerned, the statistic show that hanging with more advanced procedures is for safer than techniques such as lethal injection,” said the Centre. The Centre said it had sought views of all states on the report of the Law Commission but none touched upon critical issues of infrastructure and technological requirements associated with lethal injection and their level of preparedness to adopt such a mode. “The Government of Uttarakhand also rightly pointed out that the new chemical of lethal injection if known to the public can be misused,” it added. The Centre has also said that the process of execution is a factor taken into account while awarding death penalty and decided to ensure that it is confined to the very rare stuff. It referred to Shashi Nair versus Union of India to say that death penalty has a deterrent effect and making the entire process of death penalty overly comfortable and painless for the convict will substantially reduce its effectiveness in acting as a deterrent against abhorrent criminal acts as was intended by the legislature. “Capital punishment is confined to a bare minimum and there are a large number of cases where sentences were commuted to life and only three execution have been carried out during the years 2012 to 2015 and these are cases of those convicted of heinous offences of terrorism or waging war,” it said to buttress its argument. The Centre also vehemently opposed the argument that the provision of execution of death sentence by hanging in the CrPC was contrary to the Air Force or Army Act. “…the primary mode of execution in the Air Force Act, Army Act and Navy Act is still death by being hanged by the neck till he is dead and that being shot to death has been provided as a second alternative considering the martial nature of armed forces,” it said. “The same parallels cannot be drawn for execution of a condemned prisoner and civilian life. Thus the mode of execution and options under the Air Force Act, the Army Act and the Navy Act cannot be held to be discriminatory in nature,” it claimed. It also said that execution by firing squad is not fail-safe and can be extremely painful if the shooters miss the heart by accident or intentions the prisoner bleeds slowly to death. Those who pull the trigger suffer from a form of post-traumatic stress. In fact, Vietnam recently abandoned the firing squad in favour of lethal injection in part because of the distress experience by the shooters. Furthermore, it has been reported in Indonesia that during firing squad executions in certain instances where the marksman missed the target, the prisoner resuscitates having to be shot again.